The 2016 race in Baku, Azerbaijan, was, to put it nicely, boring. The 2017 Azerbaijan Grand Prix was, to put it nicely, interesting. When the race finally ended, Red Bull's Daniel Ricciardo had won, having dropped back to 17th early in the race. Valtteri Bottas and his Mercedes stole second from the Williams of Lance Stroll while crossing the finish line. Bottas was a lap down after the first lap of the race. But the podium only tells a small portion of the story. The safety car was deployed three times. The race was red flagged once. Seven cars were retired by the end. Two of those retired twice. Fernando Alonso scored his and the team's first points of the year. The Force India drivers had another on-track issue with each other. Sebastian Vettel intentionally ran his Ferrari into the Mercedes of Lewis Hamilton—while under the safety car. Let's try to make sense of all of this. A first lap incident was the catalyst for much of what happened later in the race. Going into turn 3, Bottas took a little too much curb and couldn't get his car turned fast enough. Thankfully for him, Kimi Raikkonen's Ferrari was there to keep him from hitting the wall. Bottas damaged the car's nose and punctured his front right as he pushed Raikkonen into the wall. The impact caused Raikkonen's car to lose all sorts of little winglets and bits, which the car shed—piece by piece—over the course of the next 16 laps. Bottas limped around the second longest track on the Formula One calendar. By the time he left the pits after getting a new nose and tires, he had been lapped by almost half the field. Things were not looking good for even a decent result. This seemingly minor crash was the start of putting cars out of position. It was also the beginning of Raikkonen cosplaying as Johnny Appleseed, but with carbon fiber instead of apples, around the track. A few laps later, Ricciardo pitted early after starting tenth. Debris from the Bottas/Raikkonen collision had found its way into his brake ducts causing them to start to overheat. After clearing the ducts, Ricciardo rejoined the field in 17th. Things were not looking good for even a decent result. Max Verstappen also picked up a bunch of debris from the Bottas/Raikkonen clash. Verstappen would be out by lap 11, stopping his car on track. On lap 11, Daniil Kvyat's Toro Rosso stopped on track. This brought out the first safety car so his car could be removed. The race resumed on lap 16 and the safety car was almost immediately called back out. Raikkonen's Ferrari shed some large pieces on the restart, leaving the front straight littered with debris. While leading the field under the safety car, Hamilton was hit from behind by Vettel as they exited a corner. Vettel would later say that he thought Hamilton brake-checked him. The contact damaged Vettel's front wing. He then pulled alongside Hamilton, waving his hand at him. Vettel then turned his car into Hamilton's, making wheel-to-wheel contact. The Drive will be taking a more detailed look into this incident a little later. There may be some post-race repercussions from the incident. The race went green again on lap 21. In turn two, Esteban Ocon tried an inside pass on his Force India teammate, Sergio Perez. After making the pass, he kept pushing Perez over. Ocon's rear right hit the front left of Perez. This knocked off Perez's front wing and damaged the front right suspension when the car hit the wall. Large pieces of Force India bodywork was then hit by Raikkonen, which punctured his right rear tire. All three headed for the pits. Ocon got serviced and sent back out. Perez's car was too damaged and was retired. The carcass of Raikkonen's tire ripped the rear wing and floor of his car to pieces as he drove back to the pits. His car was pulled into the garage and retired with extensive damage. At the urging of Alonso, the race was red flagged as the track was now a giant debris field of carbon fiber, mostly from Raikkonen's car. The field gathered in pit lane so the track could be cleaned. At this point, Hamilton and Vettel still held first and second. The Williams pair of Felipe Massa and Stroll were in third and fourth. Ricciardo has found his way up to fifth and Bottas had gotten back on the lead lap and was working his way through the field. When the race resumed, Ricciardo passed both Williams and the Renault of Nico Hulkenberg going into turn 1. Stroll was in the process of passing Massa at the same time. Soon after, Massa starting dropping through the field. He returned to pits and retired with a broken rear damper. Vettel was then given a ten-second stop-and-go drive through penalty for his intentional contact with Hamilton. Just as that was handed out, the padded insert around Hamilton's head came loose. The team was instructed to pit Hamilton to repair it. Hamilton came in for the fix and returned in eighth. Vettel served his penalty a lap later. He rejoined in seventh, in front of Hamilton. Shortly thereafter, the running order up front was now Ricciardo, Stroll, Kevin Magnussen, Ocon, Bottas, Vettel, Hamilton, and Alonso. One at a time, Bottas, Vettel, and Hamilton passed Ocon and Magnussen. In the closing laps, Bottas was closing on Stroll, but it looked like there was too much of a gap and not enough laps left to make the pass. On the last lap, on the mile long run from the last corner to the finish line, Bottas got in the draft of Stroll. Just as they came to the line, Bottas seemed to find a massive amount of speed, taking second place less than a car length. It was later discovered that Stroll's engine was beginning to fail as the approached the line. A radio transmission was played of Stroll yelling out "My engine!" as Bottas snatched second place at the line. But, for Stroll who's year didn't start off so well, third place is an amazing result for both he and Williams. Inexplicably, Ricciardo recovered from 17th to win and Bottas dug himself out of being a lap down to take second. 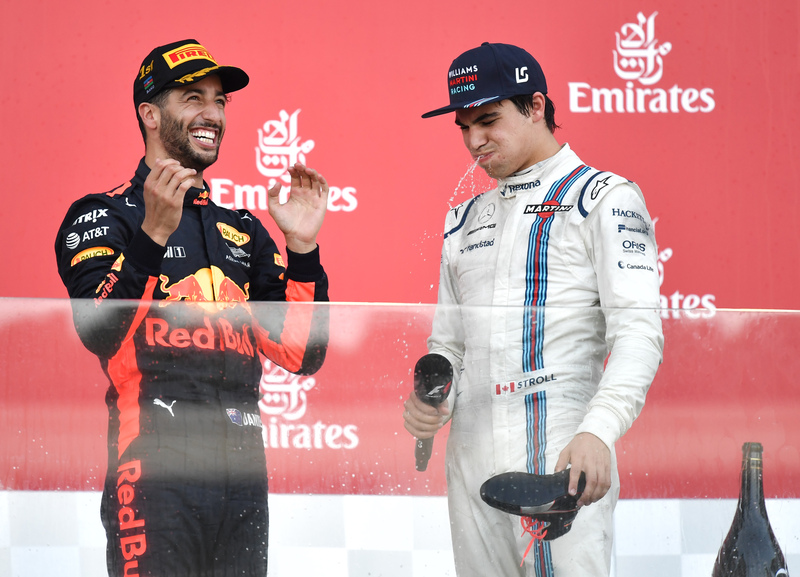 Stroll took his first Formula One podium. For as much attrition and weirdness that happened in this race, these podiums were not gifts of circumstance. They were rightfully earned. Speaking of attrition, there were a few other retirements that we passed over. Joylon Palmer had a KERS/brake failure on lap 8. Hulkenberg clipped the wall and broke his suspension. Both Perez and Raikkonen were able to repair their cars under the red flag and unretired. Sadly, the damage was more extensive as both cars retired again in the closing laps of the race. And even more fantastic was Alonso finishing in ninth place. This gives he and McLaren-Honda their first two points of the year. It might not seem like much, but with the year the team is having, this result will feel like a win. 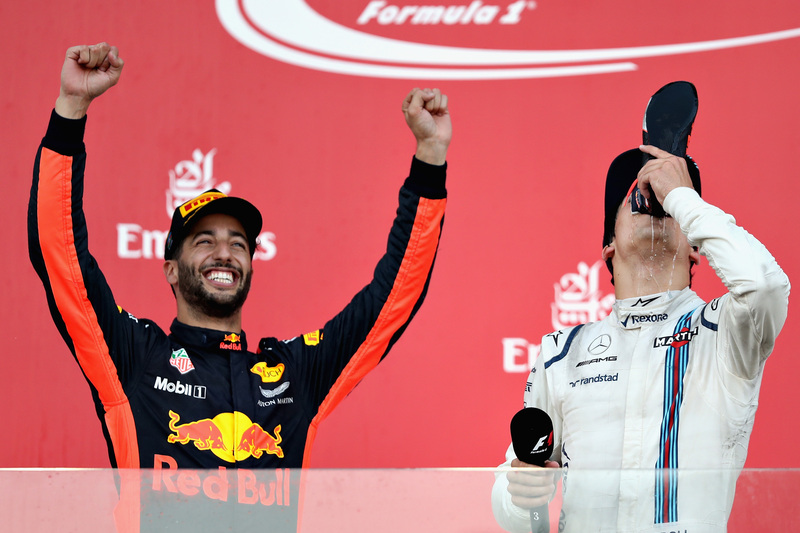 And of course, to celebrate his first podium, Ricciardo got Stroll to have a drink from Ricciardo's shoe. That about covers all of the action from the Azerbaijan Grand Prix. It was a race that will be talked about for years to come. It was an interesting, if not a great race. Sergio Perez must have gotten hit with turtle shell right before he crashed in Turn 8. Watch Lewis Hamilton's pole lap around the tight and fast Baku street circuit. The thrill is gone, and Alonso has set a deadline for results. The Formula One legend-turned-Mercedes team boss says Vettel's performance in Bahrain has the Germans concerned. On the eve of the European Grand Prix in Azerbaijan, some important things to remember about Formula 1.